Having seen the livestream of the Bolshoi’s Nutcracker and enjoyed the experience of seeing the production not only in the way it was choreographed but also in the way it was presented so clearly on film, the subsequent livestream of the Bolshoi’s La Bayadère is disappointing. Considered the final masterpiece of choreographer Marius Petipa, the ballet was first presented at the Imperial Bolshoi Kamenny Theatre in St. Petersburg in 1877 and comprised four acts. The first three detailed a complex story of love, betrayal, power and jealousy in an exotic Indian Raj context; the third act, known as the Kingdom of the Shades, is a white, ethereal composition of extraordinary beauty that imagines the meeting of the two lovers, Nikya and Solor, in the afterworld, free from the intrigues of the Rajah’s court. 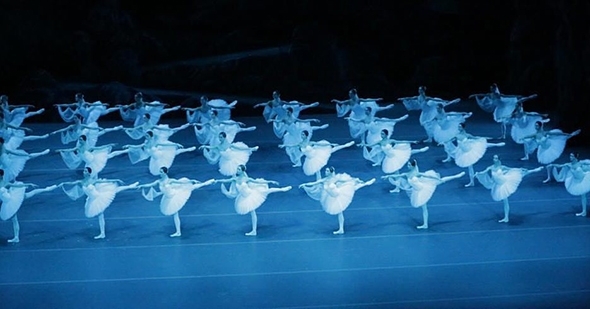 It is this act that is often presented alone as La Bayadère but whenever the complete ballet is produced the original four acts are often condensed to three — as in Yuri Grigorovich’s current Bolshoi production — based on Vakhtang Chabukiani’s 1941 version for the Kirov/Maryinsky Ballet: the first act is the introduction of the principal characters and the exposition of the story with lots of mime; the second is the death of Nikiya by poisoning prior to the wedding of Solor and the Rajah’s daughter Gamzatti with all its divertissements, and the final act is the Kingdom of the Shades. There have been many versions and reconstructions since 1877, each of which appears further and further away not so much from Petipa’s choreography, but from the circumstances of La Bayadère’s creation for what was then the Imperial Russian Ballet. That its Tsarist association survived the 1917 Revolution is a story of tenacity and political sleight-of-hand described in Christina Ezrahi’s fascinating book, Swans of the Kremlin, but even as it has become one of today’s most recognizable classical ballets, it is hard to engage in the story. Presenter Katya Novikova suggested the subject of La Bayadère was inspired by Tsarevich Alexander’s recent visit to India; certainly the Indian iconography and music is presented entirely through a western sensibility. The interest in the ballet, beyond the Kingdom of the Shades, lies more with the interpretation of the roles and the quality of the dancing. In the first two acts, which depend heavily on mime, the performances of Olga Smirnova as Nikiya, Olga Marchenkova as Gamzatti and Artemy Belyakov as Solor never seem to gel, either within themselves, with each other or with the story; the love, jealousy and betrayal are indicated but not fully embodied. In a narrative that is essentially a western orientalist concoction, the portrayal of human values with which we can empathise is vital. The closest Smirnova comes to this — and the closest Petipa came to an oriental inspiration — is in her sensual confession of love for Solor at the feet of Gamzatti in the second act. Throughout La Bayadère we are, of course, only present through the subjectivity of the camera lens directed by Isabelle Julien for Pathé Live, and what the camera can see is not necessarily what the audience can see; the intimacy of the closeup is intrusive in a way that a regular view from the audience can never achieve. Classical ballet has prescribed ways of moving and telling stories that belong within the proscenium setting; when select cinematic processes translate these narrative elements to the big screen, they can affect our perception of the art form. Although we will watch intently every move and gesture of a principal dancer during a solo, it is always within the context of the stage setting. Julien’s focus during La Bayadère tends to replace the ‘best seat in the house’ for a contrived point of view; from a purely balletic perspective, it is false. This is particularly noticeable in the famous entrance of the 32 dancers in the Kingdom of the Shades. The choreography forms a slow, painterly procession of arabesque poses that can only be fully appreciated on the scale of the proscenium stage. Julien instead makes a cinematic choice to show only a part of the composition, one that focuses on a narrowly defined vertical angle that removes the magic of the horizontal effect. It is an instance of the live stream inserting its own visual interpretation of the ballet rather than respecting the conventions of balletic perspective; instead of enhancing that perspective through the camera, Julien removes us further from what Petipa had imagined.